These Chocolate Rugelach are incredibly tender and flaky, thanks to the cream cheese-based dough. 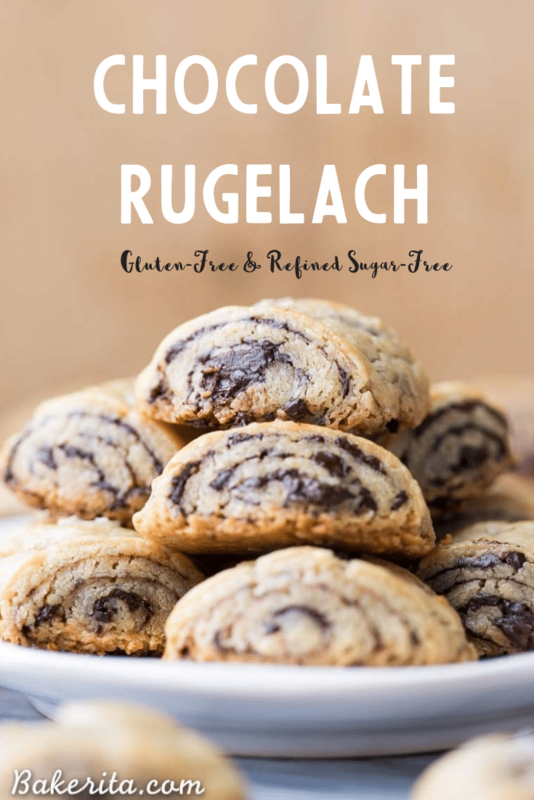 These refined sugar-free and gluten-free rugelach are filled with dark chocolate shavings for an irresistible holiday treat. For as long as I can remember, I’ve wanted a garden. Mostly because I found the idea of growing my own food to be a novel one, having grown up in suburban San Diego with not many gardens around that I remember, save for the garden in our school yard. As soon as I got my first apartment out of college last year, I recruited my roommate Ally to help me assemble an herb garden. We loved and tended to it all summer and into fall, watching it thrive and using the fruits of our labor in our meals and letting them inspire my treats, like these Raspberry Mint Brownies. Then, Seattle winter came and our plants all died a sad death, turning into shriveled grey twigs. Now that I’m pretty much settled into my new apartment in San Diego, I decided it was time for as much of a garden as I could squeeze onto my relatively small patio. I started with herbs – I have basil, mint, thyme, rosemary, and the most recent addition, peppermint. My most exciting recent addition, though? My citrus trees!!! I took forever at the nursery as I decided precisely which trees I wanted, and after consulting with my Instagram followers and the kind man at the nursery on which to choose, I went with a Meyer lemon tree, a drawf Bearss lime tree, and a dwarf Rio Grande grapefruit tree. I finally got it all on my patio and just seeing them out there gives me warm fuzzies inside – I want to add even more goodies out there too! Let me know your favorite foods you can grow in a container in the comments if you grow anything :D it’s addicting to be able to snag ingredients from a few feet outside my kitchen, and I’m already antsy for my trees to be heavy with fruit. The part of me that wants to grow my own food is the same part of me that loves to bake and cook – there’s a satisfaction in the process of creation, whether it’s food, art, or fruits and veggies. These Chocolate Rugelach? They’re definitely a creation worth making. 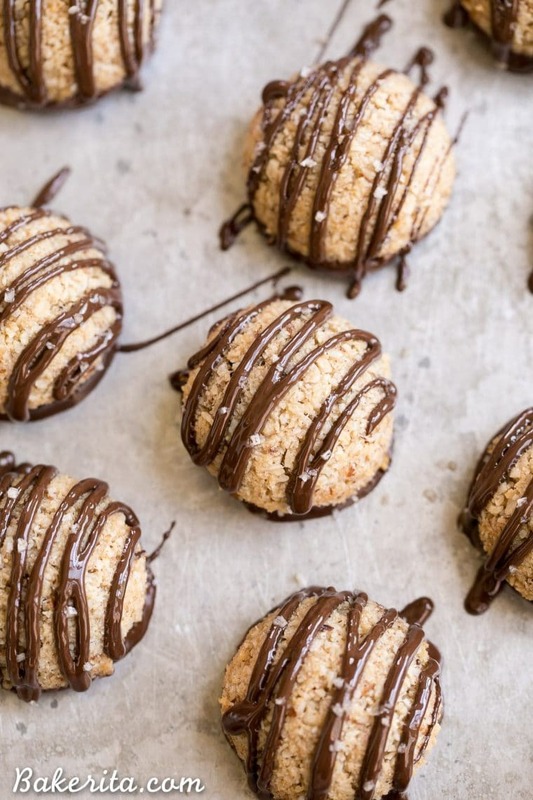 They aren’t the quickest cookies to make, as they do have a few steps, but they aren’t hard to make at all and the outcome is incredibly delicious. 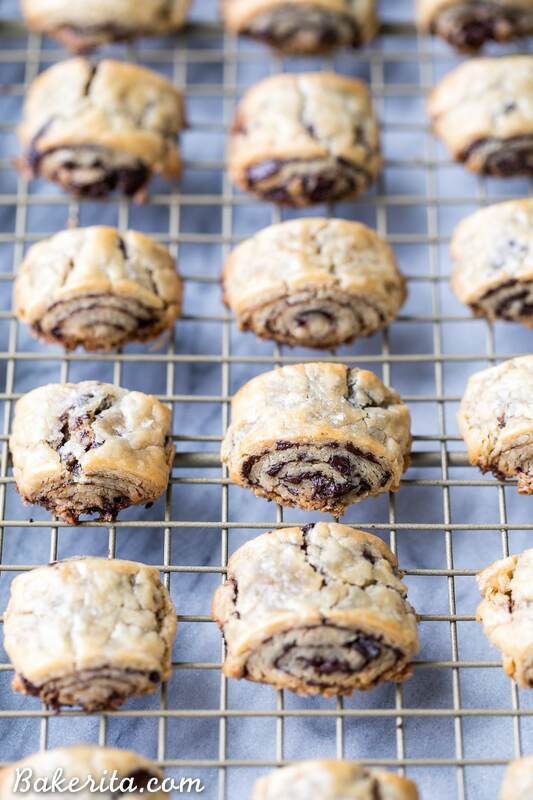 I’ve made rugelach a few times before (see Chocolate Chip Rugelach, Nutella Raspberry Rugelach and Apple Butter Rugelach) and each time, I have a hard time not devouring the whole batch straight off the pan. This year, I vowed to make a gluten-free and refined sugar-free version. It required a few tests to get the ratios right and make sure they didn’t end up so buttery that they they lost their structural integrity, but my family definitely didn’t mind devouring the test batches. These rugelach, which are a traditional Jewish cookie, are incredibly tender and flaky thanks to the signature cream cheese dough. The cream cheese lends a softness and a tang to the dough, and the butter makes the cookies bake up to be super flaky. There’s only a small amount of sugar in it, letting most of the sweetness come from the filling. I like to add a hint of cinnamon for warmth, too. I filled these gluten-free rugelach with very finely chopped dark chocolate, but you can go wild with different fillings. In my test batches, I made some with apple butter, some slathered with almond butter and sprinkled with chocolate, and some with strawberry jam + chopped walnuts. You can also go more traditional, with raisins and walnuts. I baked up a whole batch, and have been eating them all the time out of the freezer – they’re irresistible! 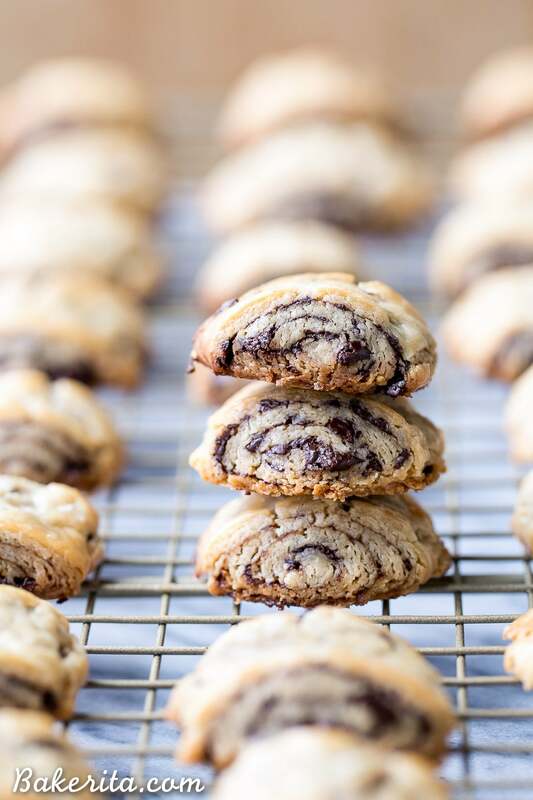 You’re going to love these gluten-free chocolate rugelach – I bet you won’t be able to eat just one of these irresistibly flaky cookies. This recipe is also a part of a super fun virtual cookie swap #calmandbrightcookienight with 33 (!!!) delicious cookies by some super talented bloggers. 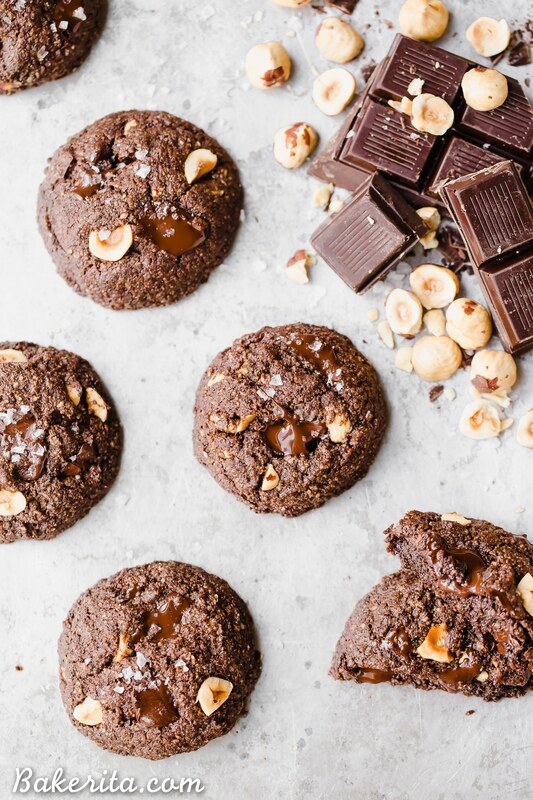 The swap is being hosted by The Modern Proper – head over to their post to see ALL the cookies! In a the bowl of a stand mixer, combine the almond flour, tapioca flour, coconut sugar, salt, and cinnamon on low until mixed. Add in the butter and cream cheese and mix on low speed. The dough will get crumbly and then start to come together. Mix until the dough is just combined - some small bits of butter are okay. This can also be done in a bowl with a pastry cutter and wooden spoon, if you don’t have a stand mixer. Shape the mixture into a large rectangle. Wrap the dough in plastic wrap and chill for at least 2 hours or up to 1 week. When ready to prepare the cookies, preheat the oven to 350°F. Cut dough into 4 equally-sized pieces. Sprinkle your rolling surface with tapioca flour (or in between sheets of parchment paper) and roll out one piece of dough at a time into a 12-inch by 4-inch rectangle. Sprinkle 1/4 of the finely chopped chocolate evenly on the dough and lightly run your rolling pin over the chocolate to press it into dough. Working from the long end, gently roll the dough into a 12-inch long log. You can use a bench scraper to help you lift and roll the dough more easily. Once it's all rolled up, make sure the seam is at the bottom. Place in the freezer for 15 minutes to firm up the dough (this will also help you make cleaner cuts. You can also wrap the dough plastic wrap and freeze for up to 3 months at this point). Remove from the freezer. Brush the dough log with milk. Cut each log into 12 equal pieces, about 1” each. Place upright on lined baking sheets. Bake each sheet individually for 22-25 minutes or until lightly golden. Cool on wire racks. Store in airtight containers - they also freeze really well. Here are others you might like too! That is so fun that you have an herb garden, Rachel! I’ve always wanted to have one too, so that (and a regular vegetable garden) are on my list for next year. And yay for the citrus tree! I saw your IG story and it all looks perfect! 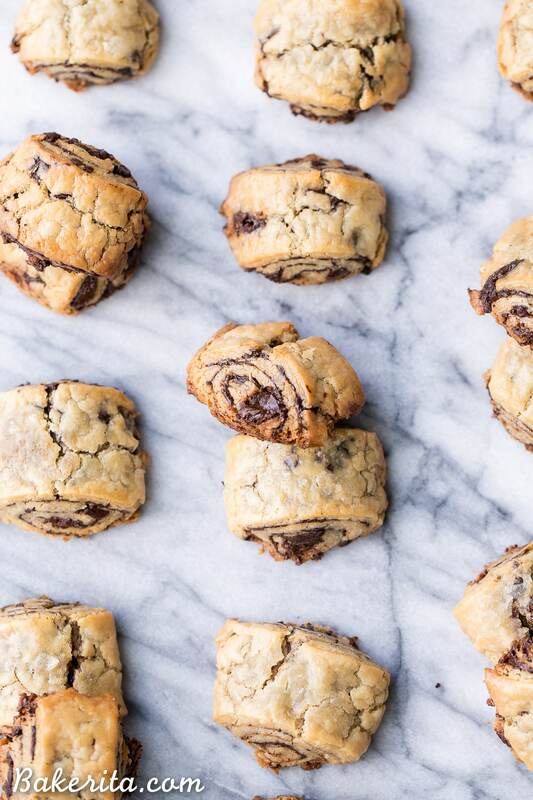 As do these chocolate rugelach. I don’t think I’ve had one before, but I love the looks of it. So perfect for a sweet treat! I haven’t had rugelach in soooooo long and I can hardly even describe how amazing this chocolate version is looking to me right now! So craving a few to go with my coffee this morning! They’re one of my all time favorites! Wish I could share a few from my freezer stash with you :) thanks Sarah! Ah! I can’t wait make these for Hanukkah. My family adores rugelach and I bet they will go crazy for this recipe. If they love rugelach as much as my family, they definitely will! :) Thanks Nicole. Rugelach hold such a special place in my heart (they were my grandma’s famous cookies!) and these look soooo good! We finally have space for a garden where we moved and I am sooo excited for it! These look so cute and I can totally imagine why they are addictive! Need to try a rugelach soon..
I’m so glad you got your herb garden going, and citrus trees are the best! Mine are finally producing a decent amount and I’m so happy. 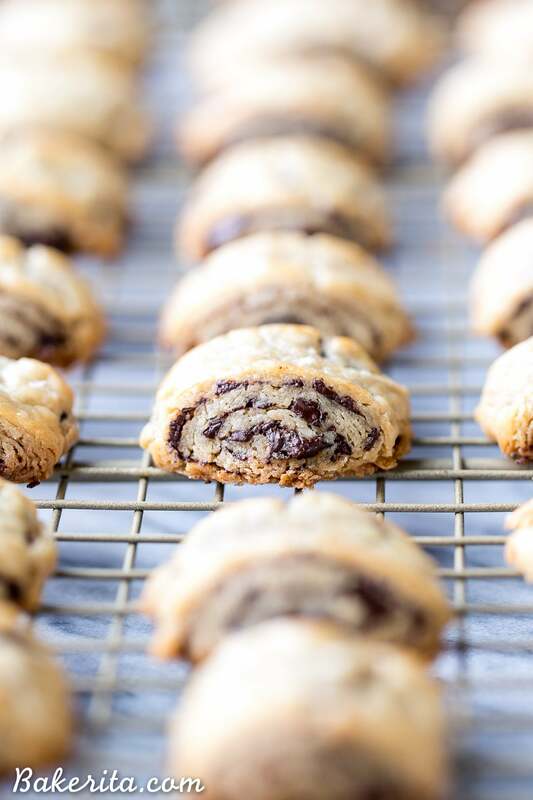 :) I’ve never made rugelach cookies and need to change that. These are so festive and such a great GF option! That’s so exciting, Marcie! I bought some that are already pretty mature so I’m hoping I get some fruit this year too. Thanks so much! When I was a kid, all I wanted was a yard with a big tree and tire swing. It was not to be. But now our appt is right by a public green, and there are lots of trees. 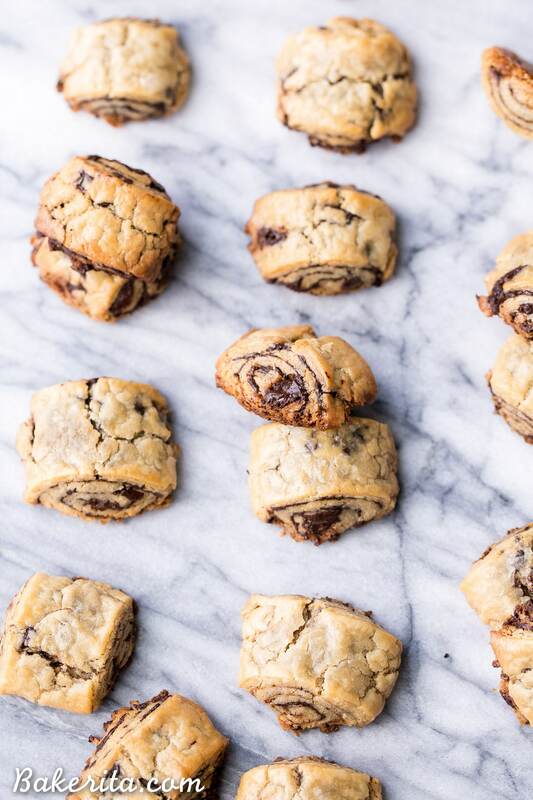 :) One thing that hasn’t changed from when I was small…my love of chocolate rugelach. Buttery and flaky and full of Christmas memories. Thanks so much Annie! I always wanted a tire swing too – I remember my dad swinging me on a big hanging palm branch instead, haha! Yay for an herb garden and I love that you got citrus trees – especially a Meyer lemon one!! My childhood neighbor used to bring over rugelach for us every year and it’s been so long since I’ve had any! Totally want to try making yours, they look perfect and I love that they’re gluten-free! It’s been too long since I’ve made rugelach! Love this chocolate variation! Thanks so much, Jessica. It’s one of my favorites! 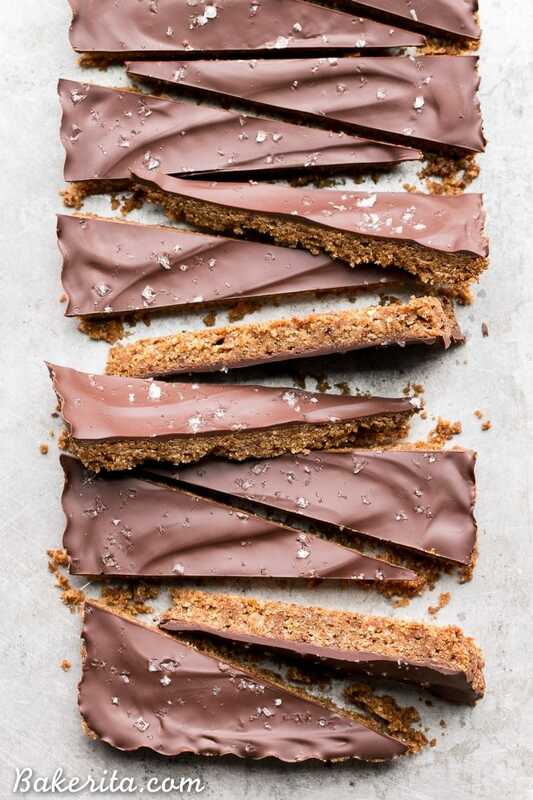 Yes please, I love the combination of flaky pastry and dark chocolate! I loved these cookies! They did take a while to make, but they were so worth it!!! They were creamy and sweet. I put nutella in some of mine and different types of jams in the others. Thanks for the amazing gluten free recipe! So glad you loved these, Sky! They’re one of my personal favorites as well :) a labor of love, but so worth it! Thanks for the feedback. Hi, made my first batch and they smooshed out while baking. Only a few turned out picture perfect. Any suggestions to help them hold together better? Hmm, how frustrating, sorry for your trouble Susan! Were they firm and fully chilled when you went to bake them? That’s the main thing that makes me think they wouldn’t hold their shape. These look really delicious! They make me remember my mother’s chocolate rolls…she puts cottage cheese in the dough. :) But I can’t really have dairy… Do you have any recommendation for the cream cheese? Maybe coconut milk? What if I use cottage cheese (that is more easily digestible for me)? Then I will make them with cream cheese first and after that I will try the sub. Hi; the recipe states to sprinkle 1/4 of the chocolate but I can’t seem to find when to add the remainder of the chocolate. Can you please tel me what I’ve missed? Thank you! Hi Bibi, since you cut the dough into four separate pieces to roll out, you’ll use 1/4 of the chocolate with each of them. You can see that explained in step 5. Hope you enjoy them!